The hand knit hearts I made for Valentine’s Day were such a hit, I absolutely had to do something equally fabulous for Easter. If you recall the my creative/ng process that I shared with you when I made the super long rainbow scarf, you’ll appreciate knowing that this took several do overs. 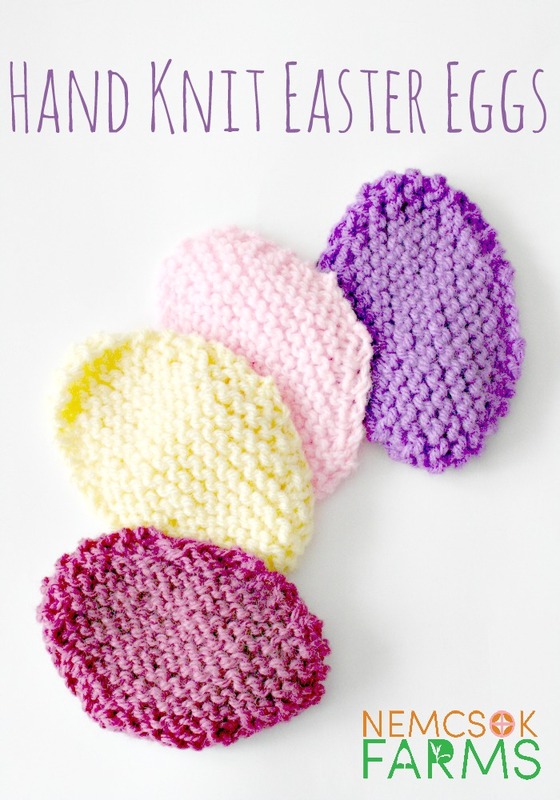 This is another really simple pattern, using only the knit stitch, increases and decreases ( fear not my friends, I’ll show you how ) and it takes all of 20 minutes to make one egg. And once you start making them, the possibilities are endless. They make great decor items for any table, nice little wash cloths and coasters for your Easter Feast, or piece them into arrangements for table runners and even wall hangings. I’ve got a few of these projects lined up to share with you, but first we need to start with the basics. In order to make these eggs lay flat, I used the garter stitch. 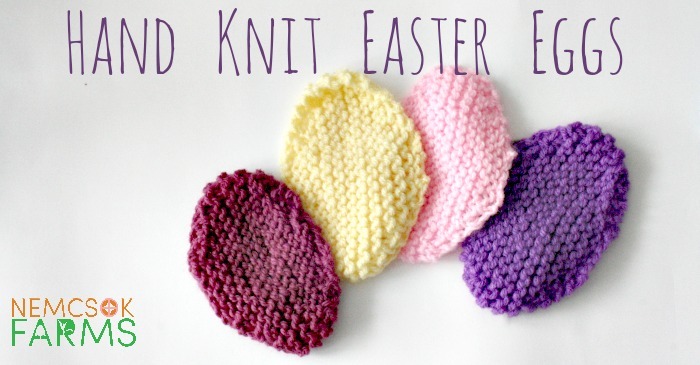 That means you knit on both the wrong and right sides, or simply put, no purl stitches were used in the making of this Easter craft. Because we’re using only the knit stitch, we’re going to use the M1L ( make one left ) increase, the same one we used in the knitted hearts, but I’m illustrating it again below. What you want to do is use your left needle to pick up the bar coming from the next stitch on the left needle. In the photo below I am pointing at where to lift up the stitch. So you use your left needle to slide under that bar, and it will slide right onto the tip of your left needle. 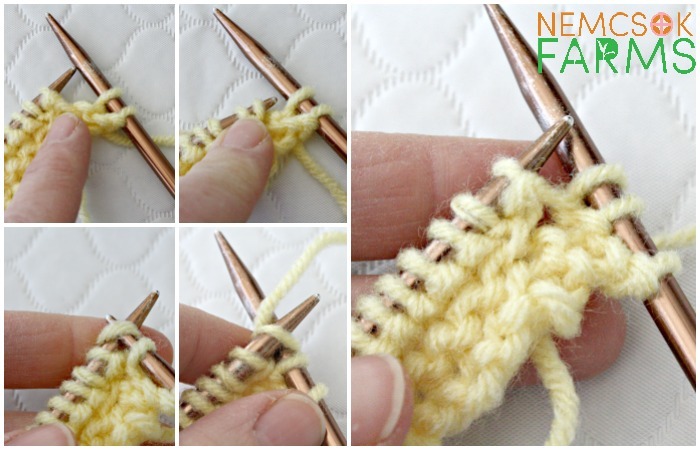 Use your right needle to knit it as you would any other stitch. It’s really quite simple, even if it is a bit tight, and takes a wee bit of practice to get it working smoothly for you. Once you’ve got it though, you’ll be happy because it is an invisible increase, that doesn’t leave a bump or a gap. In order to get the egg shape we also need to decrease, and we have accomplished that just by using the K2tog ( knit two together) which is exactly what it sounds like. You’ve got this. straight knitting needles, any size. The bigger the needles, the bigger the eggs. 5 mm ( US 8) are a great place to start. You’ll love what my friends are doing for Easter – from life size board games to breakfast casseroles.